Confessions of a Single Parent Pessimist: Planning Chunk's 2nd Birthday Party! Planning Chunk's 2nd Birthday Party! It's that time of year again (already!!) and I find myself pressuring myself again to try and do lots of things for Chunk's 2nd birthday. I'm mad, as I should save the effort for a few years time so that it will be more appreciated and actually remembered by him! But anyway, I'm stubborn and whilst I can't stand social functions, I'm forcing myself to try to do them when possible to avoid Chunk being as socially inept as me! Last year I made a birthday cake the day before his little family party, and I had an emotional breakdown when at midnight it was still not finished, because the giant cupcake had collapsed twice and I was fast running out of spare ingredients! 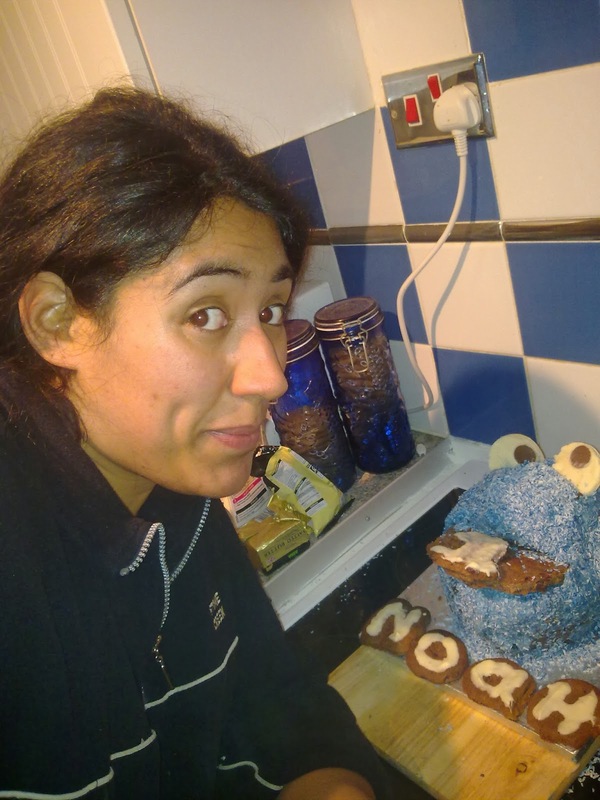 In the end it became a giant Cookie Monster head as opposed to a Giant Cupcake Cookie Monster, which looked and tasted pretty good considering I'm no baker, but it wasn't worth the stress, pressure and tears! So this year I've decided to look for someone else to make it as I actually want to enjoy the lead up to his birthday rather than having a nervous breakdown. Cue Daisy Brydon. 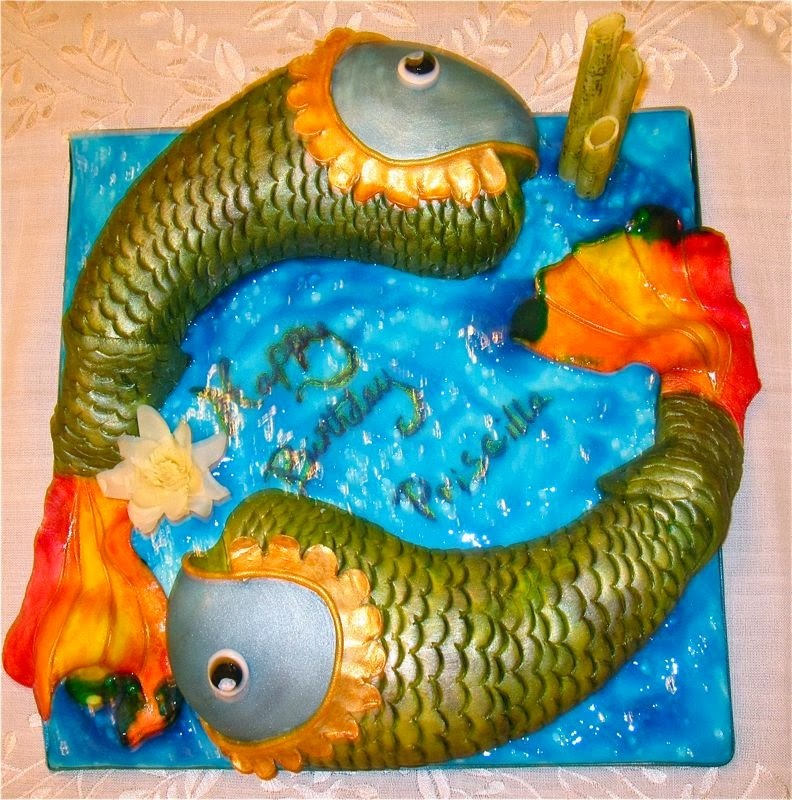 She's a cake sculptress from London, and is by far one of the most talented cake makers I've seen in a long while! Amazingly she's self-taught, after her grandmother inspired her by teaching her the basics when she was a child. 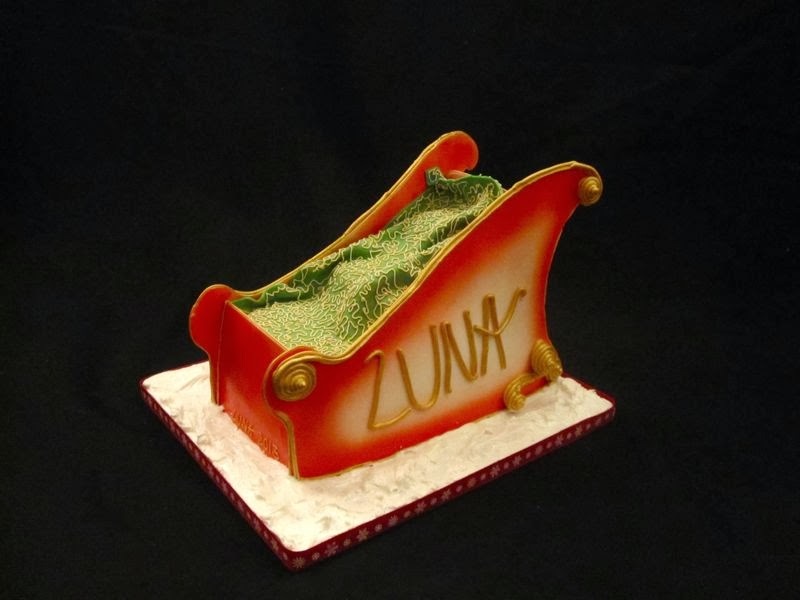 Her ethos is to ensure the taste is just as gorgeous as the design; A lot of cake designers seem to focus more on how it looks when taste is what counts! Daisy can use natural flavours such as beetroot juice instead of artificial flavouring, which is vital if you want to avoid certain additives for your little ones like I do. She can even bake gluten free and cater for people with nut allergies. As you can see from the photos, Daisy is quite the perfectionist, so I am SO excited about our cake. I've asked Daisy to create a cake based on Chunk's favourite film 'Night At The Museum' which we currently have to watch at least once a day. Daisy has sent me designs and added/changed whatever I've asked for, and she has sent me lists of cake flavours that are out of this world. She currently hand delivers to anywhere within the M25, but this may change as her company expands, which won't take long judging by those cakes! I'm loving working with Daisy, and when she admitted she wants to teach children with special needs to bake I was even more impressed- she certainly has the communication skills and sweet personality to be a hit in the classroom, just hope she can teach me a thing or two before Chunk's third birthday! To see some of Daisy's other creations, visit her Facebook or Pinterest. This is something I've got to really start looking into pronto! I've just given up my job, in attempt to spend more time with Chunk and also try to freelance write, so money is TIGHT to say the least! I'm going to look for simple, tasty and cheap recipes for buffet-style food and failing that I will head for a supermarket freezer section for the classic sausage rolls and mini pizzas! I've decided to do a little family party at the weekend, to ensure the adults in the family can attend, and then have a little toddler session at a local play centre during the week. A bonus to having it during the week is that it will be a lot quieter and cheaper! I'm currently checking out some play centres to see which will be most suitable; They will all be 2 year olds, so I don't want to go to a centre where there's lots of easy routes out of the rooms. I much prefer the smaller centres where you can view the whole play area easily (preferably from your chair!) to make sure they are not being pushed past or over by the bigger children. I will post once I've secured the venue! The family party will just be at my place, or my mum's (as she has a garden), and will just be a chance for us all to enjoy the beautiful cake, some party food and family time! 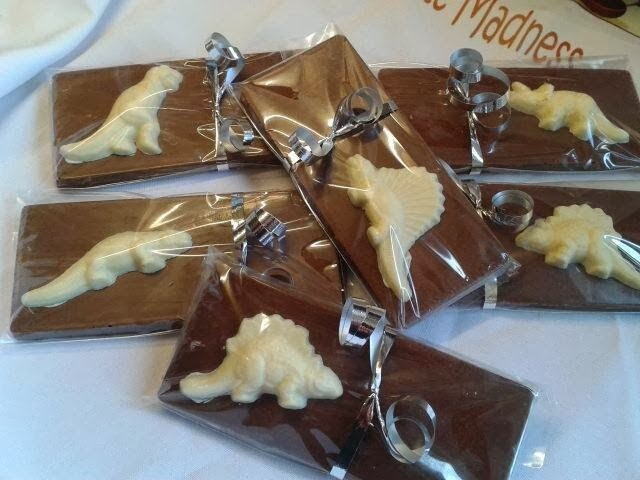 Chocolate Madness have offered to give me some gorgeous car and dinosaur chocolates (in-keeping with the cake theme) with each child's name on it for the party bags! I found the company on Twitter, and was impressed with the reviews they have received from their customers about the taste! These handmade Belgian chocolates look like they may well be a hit with the kids, unless us parents nibble on them before they get the chance! 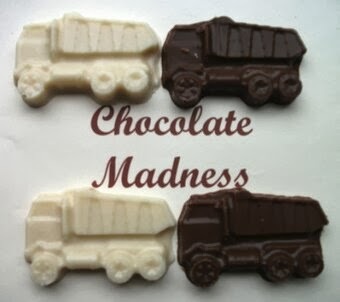 They also have chocolate lolly packs in various designs for parties, and I've got my eye on the robot and animal ones! I'm still in process of looking for other things to put in the party bags, and for the actual party bags so feel free to offer me any ideas! I've bought little bits and bobs over the last year whenever I've seen a sale or a bargain, including a drum kit, books, clothes and crafty things. I'm still on the lookout for some unique/personalised or just plain cool toys/décor for Chunk, so will let you know how I get on! Cards for me are one of the most important things for birthdays, so I look carefully for ones with beautiful, meaningful messages in them, and then add my own essay, talking about the year we have had and how much I love him. The idea is I will keep the cards in a memory box so he can read them when he's older! If you know of any good card makers, comment below! Sounds like it's going to be a great party. I recommend buying puffed pastry - cut it into strips and top with cheese before putting it in the oven. These cheese straws are always very popular and much cheaper than shop bought. A special post that your are sharing with 4 seasons blog hop. Thanks and have a nice day. I am sure it will benefit many other readers.